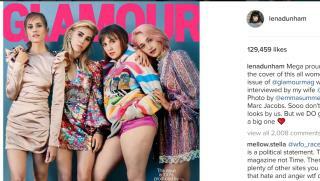 (Newser) – Lena Dunham appears on the cover of Glamour magazine's February issue with her Girls co-stars, wearing booty shorts, and she has something to say to the magazine for not Photoshopping her thighs to smooth perfection: thanks. "Here goes: throughout my teens I was told, in no uncertain terms, that I was f---ing funny looking. Potbelly, rabbit teeth, knock knees- I could never seem to get it right and it haunted my every move," she writes on Instagram. "Let's get something straight: I didn't hate what I looked like- I hated the culture that was telling me to hate it. When my career started, some people celebrated my look but always through the lens of 'isn't she brave? Isn't it such a bold move to show THAT body on TV?' ... Well, today this body is on the cover of a magazine that millions of women will read, without photoshop, my thigh on full imperfect display." From us fans please photoshoppe, a lot! Paula Deen in reality or the gorgeous silver haired lady on the cover of people. The Plantation's finest piece they said, them dar slaves! Oh, and sexually assault your sister again when you get the chance Lena. . .then you can explore your feelings about the incident in an exclusive essay that I am sure Newser will be happy to print.